TheTownCrier: Take the GOP STRAW POLL! DUNCAN HUNTER 2008! Welcome to GOP Bloggers' seventh 2008 Straw Poll. Our straw poll last month tallied over 12,000 votes. Like our last poll, you get to pick which candidates you find acceptable and which ones you don't and you get to choose which candidate is your first choice for the GOP nomination in 2008. In this poll you can indicate your state, age, and gender. New in this poll, you can indicate how many hours a week you read blogs, and how you can tell how committed you are to your first choice candidate. Like our previous polls, you can post this one on your own blog and have your readers vote in the poll directly from your blog! The code is located at the bottom of this post. 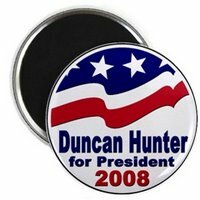 Which candidates would you accept as the 2008 GOP nominee and which would you find unacceptable, and who is your first choice?